Revisiting a realm from Magic: the Gathering is fun. It's familiar, but different, since the narrative usually has in store changes from the last time it was portrayed so as to bring in something new to the familiar. Last time the game visited Ravnica I did two landscape-styled pieces and one other. Back in the original set I did a few illustrations, too. All told, including the present art, my work for Ravnica was produced in San Jose, CA (Ravnica), Pienza, Italy (Dissension), and NYC (Gatecrash/Dragon's Maw) and now Sonoma County, CA (the current art). Ravnica's history therefore stretches across large swaths of my life. And is also fun. For this illustration, I was asked to illustrate a vampiric character. With a knife. That's it. Sometimes Magic's descriptions can be very heavy, directing the artist to a very limited set of solutions. This one was the opposite! I dug through the world-building source materials and hinged my concepts on the claustrophobic nature of the place, choosing a crowded, non-descript street scene and imagining our vampire pushing through it to reach the player. With that in mind I put together the sketch. I think the Art Director was a little surprised at the extra characters since I think they really were just thinking badass-vampire-looking-badass. I was asked to zoom in a bit more on the main character and proceed. I felt their proposed crop was fairly minor and that I would just paint the fuller angle anyway and crop for final or let them do so as they pleased. Work continued apace from there through to completion, beginning in acrylic with a tonal block-in then proceeding in oils to finish. Upon submission however we hit a couple of roadblocks, as the more fleshed-out final and color portrayals were not quite the stylistic notes they were hoping for in this unaligned character. That can happen sometimes, and since Ravnica has so many guilds that Wizards goes to great lengths to keep unique and recognizable--no easy task, and hats off to the Concept Design teams--once those lines are drawn it's important to keep them recognizable at small size. After all, most players get very few non-rule cues to set the narrative tone, so keeping the cues clear is something Wizards puts a lot of thought into. A little process gif up through first submission. I began making changes in paint but since this was going to take a couple of back-and-forths to get right I decided to switch to digital, and so finished up the piece in the end digitally, and then reapplied portions of what I liked to the painting after hand-off. Lastly, there was a decision to crop even further in, as there was late concern that her movement toward the viewer might be interpreted as giving the creature Haste, which it doesn't have (!). So, in the end, what's on the card ends up looking a bit different from the final painting. But that's how collaboration works: I get my microcosm view of what I'm doing, art-wise, while the Creative team has to balance the hundreds of cards, narrative beats and other artists' styles, to achieve the cohesive vision they intend. There's a reason people become passionate about what is "just" a card game. It's because the depth of thinking that goes behind every aspect of it is impressive. Certain years seem particularly bountiful for children in one’s life. Some years, no one you really know well is having kids, the next you get 2-3 and a handful of pregnancies besides. This year is one of bounty around me. I’ve always thought, and this is by no means an original feeling, that having a child is about the single most hopeful thing someone can do. It is trusting in the future—not the far future, just the future some decades beyond your own life. The moment the child enters the world, you are concerned with its safety and well-being, and just placing it in the world is a bet that this world will be safe for them in the future. Thus, those who have children during particularly hard times are in essence believing that those hard times won’t be forever. I think that is wonderful, especially if the having of the child begins to move the parent towards improving that world in the ways they are able, to help make their optimism real. So here’s to the parents in my life, particularly the new parents. Make the world good. Petaluma is a small city in Northern California. As you cross the Golden Gate Bridge out of San Francisco, and pass through Marin County, Petaluma is the gateway to Sonoma County on Highway 101 there. You'll know it because while Marin County is pretty nice, you suddenly enter this area of nearly endless rolling hills and oaks. 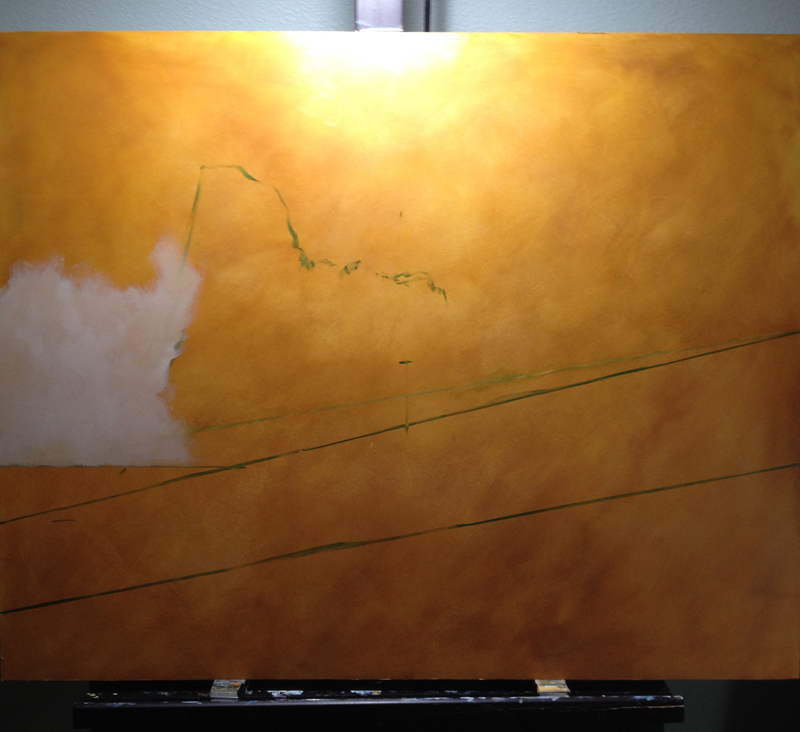 Sometimes, as in this painting, there is essentially no pre-drawing, I just paint as I go. I mentioned last time that I was going to branch out from vineyard related paintings for a bit, and part of that is from wanting to explore this area more. 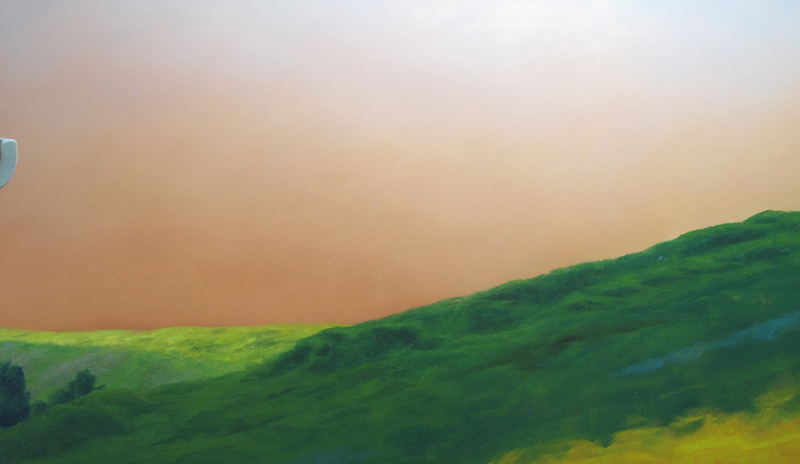 I just said that Petaluma is endless rolling hills, but this painting only indicates two such, and focuses on trees; well, actually it focuses on light. On the same trip where I took reference for this painting, I also took reference for the right side of "Turning Point." I saw enough gorgeous stuff in one afternoon walking around to inspire a dozen paintings. Now it's just a matter of finding them time to paint them! Outside of my illustration work and Hearts for Hardware, a lot of my other work doesn't really utilize pre-drawing these days anymore. That's quite a change from my earlier days. I just go straight to paint. Sometimes that means "drawing" with the paint, other times it just means massing in the forms and defining as I go, as with my still life paintings. The smooth transition of evening sky was much simpler to just paint as a mass of sky and then paint trees over it, rather than try to maintain the color gradations in all the little holes in and around the branches and edges of the tree shapes. I hadn't painting any still life paintings in 2018 through now. This was disappointing, but it has been a plenty busy year and it is really difficult to divide up my time among my different genres. But, as soon as I found an opportunity, I jumped in. One thing I love about still life painting (and this applies to my Hearts for Hardware series, as well), is the way that beholding an object in paint causes you to look at it formally, detached from your usual context of seeing the thing. A donut appeals the eye only insofar as it excites the appetite. A red onion appeals to the eye for the way it signals that it is in good shape, fit for cutting up and cooking or adding to a meal. But the objects themselves aren't usually behold for their own visual properties: their colors, textures, contours and so on. It takes removing the item from its original context, and placing it in another. Painting is great for this because even apart from photography, paintings are meant to be beheld. The strokes and texture of paint overlay and cue to the mind that this is something that is supposed to be looked at for itself. And since these particular visuals of a donut and a red onion cannot be consumed or chopped up for stew or whatever, you can behold them without temptation.